5 day camps set in a very rustic setting. Lodging will be in a wall tent or pole cabin on heavily forested property a short walk from Whale Pass Bay. Meals will be home-cooked, hot, and plenty. 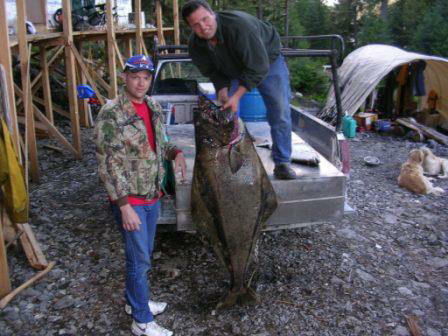 2 meals will be freshly caught Salmon, Halibut and/or Crab when the campers donate the meat. You will have a chance to share in the KP duties. We will have a worship time, a message and fellowship time each day that you can choose to be a part of, to enhance your camping adventure. There will be ample opportunities for fishing and enjoying the local sites. Our facilities and guidance make it easy for you to vacuum pack and freeze your fish for ease of transporting back home. Fishing is from boat or the shore, about 100 yards from camp. The number of fish "out front" on any particular day varies, so on slow days we provide transportation to fish other nearby rivers and lakes. Opportunities to take in the other Prince of Wales Island amenities are available for you to experience this exciting outdoor wonderland.